The crux of the issue lies in the very meaning of moral progress. In any normal meaning of the phrase there is an assumption that as we progress, we become better at things. We have less trouble with the passions: anger, greed, envy, jealousy, pride, etc. We make right decisions with greater ease and less confusion and turn away from evil with greater strength. For some, moral progress is presumed to be part of our “synergy,” our cooperation with God in our salvation, a doctrine that figures prominently in Orthodox theology. Thus, many would look for moral progress as a sign that indeed the work of God in their lives is truly taking place and bearing fruit. We are told that the “fruit of the Spirit is love, joy, peace longsuffering, kindness, goodness, faithfulness, gentleness, self-control (Gal 5:22-23). Surely this constitutes moral progress! My parish conversation turned on the example of a recovering addict/alcoholic. It is possible for an alcoholic not to drink, to live a life of sobriety. What is not possible is for an alcoholic to drink responsibly in a controlled manner over a sustained period. Thirty years of sobriety will not change this fact. No amount of not drinking will make an alcoholic a better drinker. In that sense, there is no moral progress. But surely sobriety is better than drunkenness? It is indeed. But what it represents is not an improved life, but a completely different mode of existence. It is not an improvement of the “Old Adam.” It is the “New Adam.” Someone might object that I’m using an example from outside the Church, apart from the sacraments, even outside of Holy Baptism. I am indeed. Such is the grace of God. It comes down to this: We can live a miraculous life, in which, by the Spirit, we live remarkably victorious over the passions, or we can live a moral life in which our best efforts will remain about as good or bad from one day to the next for the rest of our lives. Our victory is not a moral victory, but life from the dead. The life that St. Paul describes as the “fruit of the Spirit” can be compared to St. Peter walking on the water. No matter how much Peter might have practiced and struggled, he would never be any better at walking on water. His experience went from the miraculous life enabled by union with Christ to the moral life in which he nearly drowns. The burning desire of almost every alcoholic that I know is to be able to drink responsibly. To simply have a drink or two, relaxing with friends, without the insanity that ensues when he loses control, is a never-ending fantasy. But if he yields to the fantasy he discovers that he has made no progress whatsoever. There can be no successful practice of “moral” drinking. The same is true for us all. We would like to make “moral progress,” to become the kind of people who can be trusted to do the right thing. But it’s a fantasy. We can either live the miraculous life of Christ or the moral life of man. The moral life of man does have progress – it progresses steadily towards death. There is one last objection to the distinction I have offered here. It is the one that suggests that I’m simply engaged in word-play, making “morality” into a straw man. All language is a playing with words – it’s what we do. But these words are about an important distinction. The experience of that distinction can be seen in the successful sobriety of a recovered alcoholic, in the miraculous life of a saint, or in St. Peter’s stroll on the Sea of Galilee. It can also be seen in the angry judgments of frustrated moralists who imagine that with a bit more knowledge, a bit more effort, an occasional assist from God, they will, at last, live a better moral life, and happily buy one more round for everyone in the bar – from which they will crawl home one more time. YES. Thank you again, Fr. Stephen, for these articles, reflections, and signposts on the Way. They are VERY important for a time such as this, and have been light to many. Thanks be to God! You make this very important topic even more clear with this last article! (and also pertinent to the day this Sunday parable of the Pharisee and the Publican). Thank you! I back up Luke on this. This series of articles are fantastic. Bless, Father! Again, Bless you for your words and I pray for you and am so thankful to God for your guidance. How does gluttony fit into all of this. With an alcoholic it is certainly not easy to refrain from alcohol but with a person who struggles with the addiction of food, one still has to eat. Currently, I do a low carbish sort of thing as my body is so messed up with the years of abuse that I must refrain from sugar and have a low or moderate amount of carbs. This diet helps me feel better physically and emotionally. But, it is hard to eat this way all the time. For instance Super Bowl is tomorrow, will I not eat the chips? Or Christmas or Pascha or Birthday? You mentioned how an alcoholic desires to be able to drink moderately but it’s a fantasy. Am I in the same fantasy by trying to eat birthday cake on my birthday or chips on Super Bowl? This is a wonderful conversation on the possibility of personal progress and its propriety as a goal (and it also offers an interesting parallel to the one on societal progress which you have touched on in other articles). “The righteousness which is of God by faith” is not a self-help program (Note: I’m not taking aim at AA here which does attempt to point its members to a “higher power” by advocating “surrender” with slogans like “let go and let God”). Apropos of sobriety, however, there is a third possibility besides the alcoholic that realizes sobriety in surrender to their higher power and those who fail due to their attempt to drink socially. There is the “white knuckle” or “dry” drunk who continues to struggle against their desire to drink merely in their own strength — what Robert Pirsig calls “ego strength” and what, St. Paul, I think, would refer to as “the strength of the flesh” (in contrast to the power of the Spirit). Apropos of diet, based on my research and personal experience, there are both similarities and differences between our struggles with food and other types of struggles or addictions. Being present seems to be essential to a realization of “the power of the Spirit” in any event (i.e. the tug-of-war almost always finds us when we are lost in thought–e.g. thoughts of “progress” or “accomplishment”). The idea that an alcoholic can never drink again is just not true. It is for freedom that we are set free. As the person above points out about eating, a person who is addicted to food must not learn to stop eating but move to a different relationship with food. Same with a person who is married and feels they are a sexual addict, and I’m sure there are other example. True transformation can be a transformation of soul and spirit and can be assisted by the Spirit certainly with the end result being true freedom and true transformation. What I find perplexing is that both believers and unbelievers can undergo transformation that deeply affects their lives. Although I’m perplexed, I’m glad that it happens. I have similar thoughts as Warren Aldrich about the alcoholic. Medical science is divided on this issue (of whether or not an alcoholic can ever again drink moderately), so I’m not sure it will hold up for your comparisons here, Father Stephen, although I understand where you are going with it and I agree with your general premise that the goal of the Christian life is not moral progress. Thanks for keeping the dialogue going. Many can question whether the alcoholic can ever drink again. Medical science has long not been a helpful friend to the recovering alcoholic. My money remains on the collected wisdom (“courage, hope and strength”) as shared in the fellowship of AA. And they’ll be quite clear – you will not be able to drink again. And they would say, if you can, you were never an alcoholic. I know plenty who have lapsed after 10, 15, 20 years who would stand by the experienced contention that it is not possible. Frankly, the “medical” hope of things being otherwise is dangerous stuff. The thing that makes for relapse. But that is ultimately not my point – it’s just an example. But I hold it to be true based on 35 years of pastoral experience and many years of involvement with people in recovery. I have very much appreciated this series. I recognize that virtue is not developed directly, i.e. by trying to be more virtuous; but I can conceive of it as an indirect effect of greater union with God, as our energies and impulses are absorbed in (or replaced by) an ever-growing preoccupation with Divine life and Kingdom priorities. In this way, I had thought of it as the inverse of the Problem of Hedonism: viz, the worst way to achieve happiness is by attempting to be happy. So if happiness can be instead a byproduct of a more meaningful, self-sacrificial life, why can’t virtue be a byproduct of theosis? I’m probably showing how much I misunderstand. But that’s fine with me, since I’m asking to be taught. Given my nascent understanding, however, I have my doubts about the analogy with alcoholism. In fact, it would be rather disheartening to me to think that an alcoholic must regard himself as never fully free of his addiction. Is “alcoholic” just his true identity? Does such an assumption leave him at the mercy of fear and self-condemnation (or the shame, as you put it once, that he just “IS something wrong”)? Does that light burden and easy yoke that Christ offers not admit the possibility of full release? He may be filled with the Holy Spirit, and therefore not drunk on wine (Eph. 5), yet not merely in control of his behavior? Granted, alcoholism was not really the point. The point I take it is that sin is even more of a disease than alcoholism, something too deep for the realm of simple morality, so much so that the greatest saint never ceases to call himself a sinner. But is it not accurate to think that immorality gradually decreases and even ceases to tempt the one who turns his heart more readily, more habitually, toward the presence and pervasive love of God? Sorry to belabor points you probably have already addressed. Is it possible for an individual, on this side of death, to allow the “miraculous life of Christ” completely to swallow up any separate consideration of human morality, such that he is perfectly trustworthy, his instincts do not contradict God’s, his heart is turned naturally away from prior selfish impulses? I don’t know if my comment is out of context here, but I just caught up with the original post and since everyone has moved onto this one, I hope it’s okay to post it here. I wanted to get back to the main theme of morals and living a life for God. 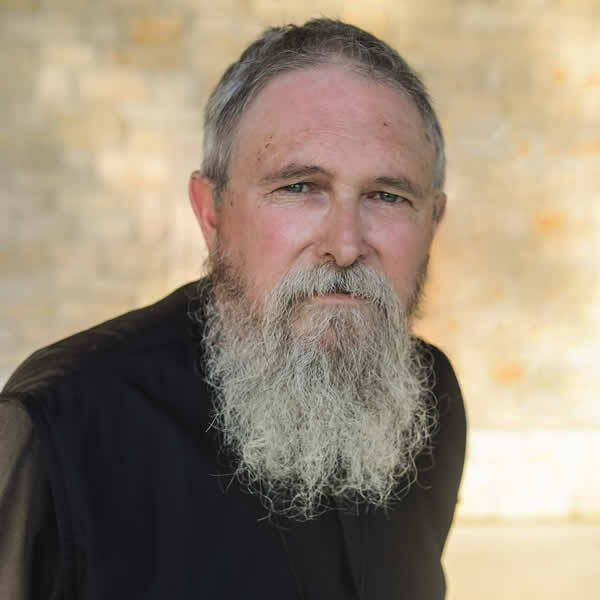 An Orthodox Christian who fasts; goes to Church regularly (and Feast Days); goes to Holy Confession and Holy Communion 3 or 4 times a year; gives some alms; helps people and in the parish etc is trying to do the right thing. But, as you said, these are moral attitudes. I see these as exercises to warm the heart. We need to keep practicing the “good” things that we see God wants us to do in order to prepare the groundwork for the (hopefully) arrival of the Holy Spirit in our hearts where He will stay and reside. Where Jesus Christ will sit on the Throne in our hearts. And then we can be transformed. We will finally be able to truly live our lives for God. A most beautiful example is the life of St. Elizabeth Grand Duchess of Russia. She was brought up in a good moral environment in Germany. She was considerate towards others, understood moderation, was meek in heart and all those other wonderful “moral virtues” which we expound on as being a good Christian. But, that wasn’t enough for God. Eventually, slowly, she was drawn closer to God and her whole being and sense of person became wrapped up with God. I’m not describing it very eloquently, but I was greatly impressed by this gradual transformation when I read it in the book written by Lubov Millar. It wasn’t a matter of becoming a better Christian, but it was a matter of wanting to be with God above all else. But, if the groundwork is unattended and neglected, then all it becomes is a false sense of being a “good Orthodox Christian” as you mentioned. I’ve come to realize this and I see that I still have a lot to do. Yes. I do need to do something. And absolutely yes, God is the only One who can transform us. But, that’s the synergy, right? And people will bring up the fact that there are saints that didn’t live as good Christians and all of a sudden were transformed, but that’s how God works. It doesn’t mean that if I, for example, need to work on my Christian attitude in order to warm my heart so that eventually the Holy Spirit will decide to reside in me, that there’s no need to do anything because maybe God will chose me to be that great example like St. Mary of Egypt or St. Moses the Ethiopian. The point is that we need to be conscientious of the fact that we shouldn’t settle into a false belief that we are being good Orthodox Christians by moral standards, but to realize that we have a higher goal; theosis. Isn’t that what you were referring to, Fr. Stephen? If, according to St John, he who is born of God does not sin, because God’s seed is in him, and if he who is born of water and Spirit is himself born of God, then how are we, who are born of God through baptism, able to sin? The mode of our birth from God is twofold: first He bestows the entire grace of adoption on those born of God, but only in potentiality. The second mode ushers in this grace -hitherto only present in potentiality- in actuality, transforming voluntarily the entire free choice [γνώμη] of the one being born so that it conforms to God who births him. The first mode possesses the grace of adoption present in potential through faith alone, but the second, in addition to faith, possesses the grace that actualizes, according to knowledge, the divine likeness (as likeness of a child to its Father), the likeness of the God who is now known in the one who knows Him. In those in whom the first mode of birth is observed it happens that, because the [temporary] disposition of their will has not yet been fully extracted and torn away from its passionate fixation and attachment to [the mind of] the flesh, and because they have not yet been completely imbued by the Spirit through the active participation in the mysteries, their inclination to sin is never very far away for the simple reason that they continue to will it. For the Spirit does not give birth to an inclination [a disposition of the will] without the consent of that will; but to the extent that the will is willing, he transforms and divinizes it. Whoever has shared in this deification through experience and knowledge becomes incapable of reverting from what he then wants and from all that he truly and precisely became cognizant of; just as the eye, once it has seen the sun can never mistake it for the moon or any of the stars. In the one undergoing the second mode of birth the Holy Spirit takes the whole of his free choice and transposes it completely from earth to heaven, and, through true knowledge realized in actual deed, refashions the intellect with the blessed beams of the light of God the Father so that he is deemed another god, experiencing through a [permanent] state obtained by grace, that which God [does not experience but] simply is according to His essence. In them, their free choice clearly becomes sinless, in conformity with their state of virtue and knowledge and thus they are unable to negate what they have become cognizant of through actual experience. So even if we should possess the Spirit of adoption, Who is a life giving-seed that bestows the likeness of the sower upon those who are born of it, but do not offer Him a disposition of the will pure of any propensity or inclination towards something else, we will, as a result, willingly sin, even after being born through water and the Spirit. But if, to the contrary, we were to prepare the disposition of our will to receive in knowledge [as deep awareness] the operations and energies of the water and the Spirit, then, through our practical asceticism the mystical water would cleanse our conscience and the life-creating Spirit would actualize in us the unchanging perfection of the good, through knowledge acquired in experience. What is lacking therefore in each of us who is still able to sin, is the unequivocal desire to surrender our whole selves in the disposition of our will to the Spirit. Love it, Dino. Thank you. Dino, that is an excellent explanation. I love the holy fathers’ explanations. And I guess in my clumsy way I was trying to say the same thing. I heartily agree with where you are speaking from and what you are trying to communicate. Fr. Pat Reardon has long said something to the effect that if his parishioners bring up their progress (either wondering why they haven’t progressed or extolling that they they have) he immediately tells them to repent! There is freedom in his rebuke if we have ears to hear. Our ascetic struggle, even as laymen, has one purpose – to purge our tastes for the transient pleasures of this world that lead to death, and replace place them with Spirit-wrought tastes for the permanent pleasures of life in God; which is eternal life. It seems that you have done well to point out the error of the moralists. And while I am one of them (or have been often enough) I think that there remains confusion here. I know that “being a better person” is not the point at all, but in fact “being a new person” is, yet some of what you say here makes it sound like the problem is our dependence on ourselves to become a better person rather than depending on God to make us a better person. God isn’t going to make us a better person, God is going to bring the dead back to life. This is hard because it is all too easy to come to your blog (as a moral person) and try to see that a certain “mindset” or “faith,” or whatever you want to call it, will result in the moral progress we have been seeking (as if the discipline of the mind will magically do what the discipline of the body could not). So when you say, “that distinction can be seen in the successful sobriety of a recovered alcoholic” it is easy to read that sobriety will be achieved. On the one hand God is being profound (so He is) and yet from our point of view He’s being cruel. We are asking for bread and not getting it. We are being told sobriety is a stone, or that we don’t understand what sobriety is, or something else we don’t understand. We want to stop sinning, we ask God to help and then He appears to give no help, so we despair. In short, following St. Maximus, yes, it is possible to live in the true freedom of the Spirit in this life. That is granted as a theoretical. Now, I will return to the example of the alcoholic (which I am simply using as a “type” of the sinner). The natural man (to use St. Paul’s language), i.e. “flesh and blood,” “cannot inherit the Kingdom of God.” The “alcoholic” is not the person, therefore there is no inherent shame in his alcoholism (sin). But it certainly has the character of the “dust” or “nothingness” out of which he is made. That dust will be raised to a new mode of existence (ultimately in the resurrection). But just as the alcoholic cannot return to “normal” drinking, so every sinner cannot return to a “normal” life, i.e., a secular life, a natural life without God. His “morality” is nothing that is his own and it never will be. If he lives for himself alone, he will die. The alcoholic will indeed drink again in the Kingdom of God. He may, as many do, partake of the Divine Cup in this life without temptation. But what must be seen in all of this is the problems raised by moralistic thinking (i.e. the forensic/legal model). The problem is within the nature and character of our being – it is ontological. That is the language of St. Maximus. And it must be maintained throughout our consideration of this, or we wind up saying things that are not true. Exist as a new man, live according to the Spirit, and you will not fulfill the lusts of the flesh. That’s clear in Scripture. But we must understand that “living according to the Spirit” is not a moral exercise. It is an exercise in a different mode of existence. It’s not about being a better man. It’s about truly becoming a human being. The old man is dead. Dead. Dead. Dead. He is a stinking corpse. Dress him up. Put makeup on him. Teach him how to behave. He is still a dressed up, made up, well-behaved smelly corpse. He is a zombie. We have so many moral zombies wandering the world today. And they eat people – devour them with their death message. Jesus is not a “great moral teacher.” He’s not a moral teacher. He is the God/Man. “Be perfect, even as your heavenly Father is perfect!” That’s not the language of morality. That is the language of the New Man. Far too many people want to walk on water. They want life-preservers. Fr. Stephen, thank you for your continued preaching on this topic. It’s much needed. As a recovering scientific rationalist I would have been confused by it, or maybe even objected to it myself, like many are currently doing, until a year or two ago when I began to see this truth for myself after I actually started to give up MY will & accept my cross, which continues to crush me. It’s now remarkable to read the Scriptures in this light because this message is everywhere! I’m reading Elder Ephraim’s excellent book, “The Art of Salvation”, and he makes the same point repeatedly. Also, there was a recent article posted on MYSTAGOGY on exactly the same topic entitled “The Spiritual Person is not Moral, but Loving”: http://www.johnsanidopoulos.com/2015/01/the-spiritual-person-is-not-moral-but.html. WE can’t achieve anything. It is God in us by the operation of his grace that makes us progress toward holiness / perfection. Yes, we have to put in arduous & constant effort, but that is really on the ascetic front of keeping the commandment so that we can get out of the way & allow God to work – no simple feat. I think St. Paul stated this succinctly in his letter to the Philipians: “Work out your salvation in fear & trembling. For it is God who is at work in you, both to will & to work for His good pleasure.” Thus, WE don’t make “progress”. The only thing that we do is die to ourselves, i.e., our sinful passions or “flesh” or “old man”, and even that is by the grace of God, so that the Holy Spirit is able to make the seed of grace grow into fruit-bearing trees in the cultivated soil of our broken hearts. More technically speaking, I think your larger point is that “morality” is really only behavior, and we can behave in an exemplary manner yet still have a nous that is asleep / blind & a heart that is dark, thus we will never see God because we’re like whitewashed tombs. The Publican & the Pharisee comes to mind. Please keep preaching the truth in love because we need to hear it! Far too many of us are stuck in the rational center of consciousness as it’s influenced by Modernism, and this bars us from entering through the doors of repentance into the the Bridal Chamber, i.e. the Kingdom of Heaven. By now you should be considered the definitive writer on this viewpoint, Fr Freeman. 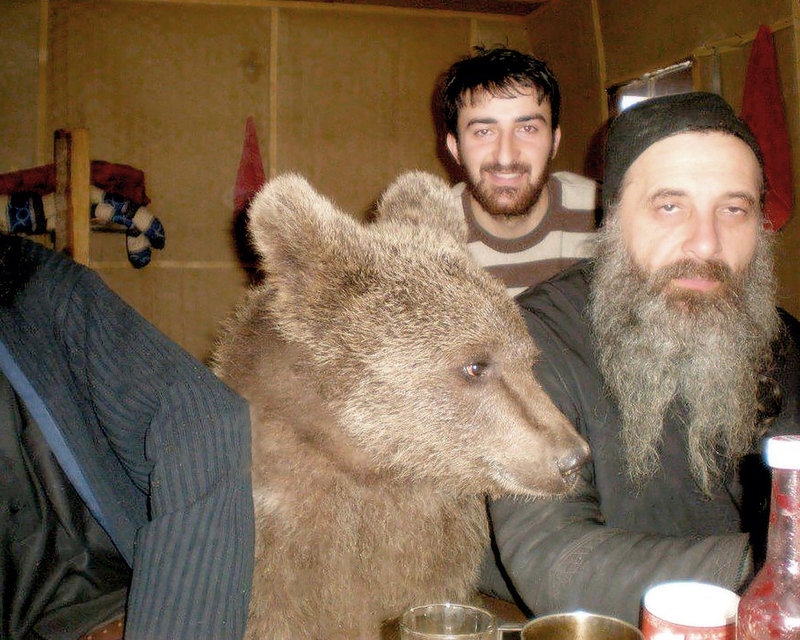 The monk-and-bear picture is worth a thousand words. I’m getting acclimated now, but one of the hardest things about Orthodoxy for me to stomach, is that we’re powerless. We can’t help ourselves, really; it’s nothing like the Hindu model, even less so like the derived self-help one. Where I live, I often hear phrases like “just trying to be good” and “stay out of trouble.” I am curious, and perhaps with your theological finesse you could explain this, but: if I fail to believe in bodily resurrection (and it is so), does this alter the implications? Have a good, sunny Sunday. I am not a clergyman nor M.D. but a Christian Orthodox Jurist. During my fifty years’carrier, and my life in Lebanon and Overseas, I met heavy alcohol drinkers. Most drink because they couldn’t face their difficult, daily problems, in a complex, pityless, merciless world, and got no parents, relatives, friends, etc. ready to help. They didn’t think to get a shelter, neither in Church, nor assistance of Priests. Some because they weren’t teached, others were sick, or because they aren’t believers, finally, peoples who didn’t have anymore, money, and in their town, specialized caritative Associations, Churches, Priests. Same concerns those who have been taking lot of drugs. Of course, my brief explanations, recommendations weren’t productive sufficiently. Even I didn’t hope it. Follow up should be offered, I believe, by Church, M.D. and (very expensive) Hospitals. Also by Administrations. Laws, Rules, Usances, should become less aggressive, much more human and protective. Rgds. Ronald. Isn´t moral progress for a christian is to love God and keep His commandments and to love one another with the love God showed to us in His love and mercy. Along with this is to stop the chatter that is going on in our mind and learn quietness and to be still. And, the big one…learning how to keep our mouths shut. This is what I am learning for one who is 75. We can indeed cooperate, and it is not nothing. But our effort in our salvation is infinitely less than God’s grace. Some want to speak of it as if it were 50/50. St. Gregory of Nyssa said that “Man is mud, whom God has commanded to become god.” The journey and its end are so infinitely great (“abundantly above all we could ask or think”), that “helping ourselves,” is almost comical. But we can say “Yes.” And we say it again and again. Think of the Theotokos. She said “Yes.” And did so throughout out her life. But we do not honor her less simply because all that was done in her and through her were the work of God. It is the same with us. I’ve been reading your blog for some time, and I so enjoy not only what you have to say, but in that you invite so many to like wise contribute via their thoughts and comments. One thing I do know, God (my Father) is not, nor ever has been opposed to effort, but is opposed to anyone thinking, they can earn anything from Him. I’d like to add that when Jesus said; I’ve come that you might have Life, he wasn’t alluding to a quick or a lengthy series of botox injections to beautify our fleshly self-efforts. There must be something in the water…http://blog.newadvent.org/2015/01/why-having-heart-of-gold-is-not-what.html Ken ! My desire is to be in and live constantly be in this state of freedom, but can I, is it only theoretically possible? I ask myself; why do I desire this? To the best of my knowledge I’ll present my answer at least as far as I can understand and know my own motivation. I desire this freedom because I know that in myself, myself outside of Christ, I live only an illusion. What I mean is, I believe that all and anything I do or will from a desire for self is vanity, vapor, smoke, illusion, or abiding in non being. I know this theoretically and because I know this I don’t wish to live according to it; according to myself, according to this non being. On the other hand, I know (theoretically) that if I can overcome myself, if I can live constantly in the Spirit of Christ, then I will truly experience life and never again be subject to illusion and non being. Is this possible or only theoretically possible? Is this something I should strive for or continue to just wade the tide, for after all its only possible in theory and I don’t even know if my own motive is correct? I’m fairly new to this post and so I might be a little of base. But I have found that we in ourselves can at times have a moral victory in our lives but it was attained by our own strength. Most of what we as individuals battle with in moral areas are our own particular weaknesses. I have also found that if we focus on our weakness and try to consciously overcome it, we, in that focus tend to give it strength and recognition, just what it needs to once again show us our weakness to it’s power in our humanity. If we allow His Spirit within to have His way, then it is He within overcoming, not I for I know in myself I cannot win, I have failed too many times in my own attempts to overcome. I hope I’m making some sense in this. It seems to me that moralism has its roots more in American deism rather than a forensic/ legal view of salvation. Can you show me a link between deism and forensic justification? Could synergism lead to the same place? Just because a theological teaching has unintended consequences does not make it untrue. Sinners tend to pervert things. One last point.Christians seem to have a funny relationship with the mind and the will. We think that anything including alcoholism, mental illness, and salvation can be conquered with just some good ole fashioned elbow grease. Thank you for the further clarification. It is very helpful! “Moral Zombies”—a great title for another follow-up post. That was the question that plagued Elder Sophrony for much of his early monastic years Michael. It’s what we pray for in the first prayer after Holy Communion: “may I always remember Thy grace and live not for myself alone, but for Thee, our Master and Benefactor”, and also that “second mode of birth” described in the quote from St Maximus I gave above. after the invocation of God has become self-moving rather than ‘active’ by the still ‘old man’. We need to be faithful first with what we have. Patience, kindness, repentance, prayer, generosity. Remember Christ’s words that our good Father will not give us a stone when we asked for bread. Only treat the bread like bread and don’t throw it away like it was a stone. If you are young – then indeed practice patience – though some receive great grace even at a young age. Mostly, be kind and learn to pray. Those who start off like a rocket at a young age are most typically found in monasteries sometime afterwards and -if zealously obedient- reach it while on their feet. But it is certainly not just ‘theoretically possible’, and it is most definitely achievable and is the what we fall short of – our only calling. Thank you for your reply Father, I can relate to the quote “something of a dance”, as well as “we are darkness and light together.” I am not young (55 years) but I am a newbie to Orthodoxy, a Catechuman with a 30 year Protestant background. I have always desired this freedom in Christ but it’s only until now in Orthodoxy that I understand that it is not only possible but from what I’m understanding it’s the very purpose of our Lords incarnation. Please correct me if I’m wrong on that. Can you elaborate on that? I think what I hear you saying is that we can’t contemplate or grow into the mysteries of God until we are freed from the passions. I love that! I believe there have been times that I’ve experienced this what you refer to as, “debate on cosmic matters with Him”, but I also can’t say that I’ve yet been freed from the passions. I want to, I really do, but there are those times when the passions scream so loud that it seems that is all I can do is to contain them let alone debate on cosmic matters. Spiritual life proper starts after dispassion because our will is not yet fully given over to God until after that… It’s simple. We still have the will to sin along with the will not to prior to that. We have certainly not yet ontologically become one with Christ in Gethsemene. We still (prior to what I called ‘Spiritual life proper’) need to struggle -for example- with distractions, reveries, yawns, worries, questions and thoughts during prayer, it is part and parcel of our struggle, especially in this world; yet for the person who is finally living “spiritual life proper”, their struggle (in the icon of Jacob’s wrestling with God) is not for that at all… It is not even with the demons. It is for the only desire of their dispassionate yet now singularly passionate being: to enter fully, more and more into God, to be even more one with Him with Whom they already are one, and subsequently (driven far more by His Spirit rather than by their own) to bring all of creation (with which they have been made aware of being one through the Holy Spirit) into that oneness. Would you say young people are given this same “taste of dispassion and freedom of the Spirit” (possibly even in a permanent way) if they happen to be suffering in a significant way, such as one experiencing the humility of recovering from heroin addiction, abuse, terminal sickness, etc.? I knew of one such glorious example (tetraplegic saintly woman) who reached the stature of the great saints thanks to how she accepted her exceedingly painful suffering… in the end, God’s grace was bestowed on her in such measure that she was in greater pain (sweet pain) from her overflowing gratitude rather than physical pain from her outward deterioration – like the martyrs. not FB but I could always do email. It can be so. Humility is rare in youth. Honestly, I find these anti-morality pieces to be almost meaningless, confusing, and without an practical application. You spend several hundred words stating your cases – rather than proving it – and provide no answers as to how one is to practically live this amoral, miraculous, christian life. As I follow your thought you sound much more an evangelical Protestant advocating a miraculous experience free of the synergistic labor taught by Christ, and the Apostles. Your example form the “alchoholic” seems to assume modern psychology’s twisted, and unscriptural view of man as a biological computer who’s alcoholic programming is considered a disease from which there is no relief. However it has been shown time and again that many who struggle with drunkeness can overcome the sin and dink responsibly when provided with a Christian treatment. I will continue to avoid these peices as I find them to be unusefull for the spiritual life and a temptation to speculative controversies over definitions. I just have to add that I would swear I was reading a calvinist’s statement on total depravity. I believe you have misinterpreted -which is always a possibility for us unfortunately- what Father Stephen has been talking about. Does not St John the Evangelist say the same when he calls all -including his already deified self- sinners (1 John 1: 8)? And it is certainly practical -but you must fathom what it means to hate one’s life (John 12:25). the deep awareness of our depravity, our spiritual illness and its recollection is a great aid in the continual remembrance of God throughout the day. Adam, I understand it can be frustrating when what someone says or writes just doesn’t resonate, for whatever reason. Probably best to just leave it at that point. One person’s medicine can become another’s poison. I’ve written elsewhere, and it comes to mind on the heels of this past Sunday in the Church calendar, that the whole of Fr. 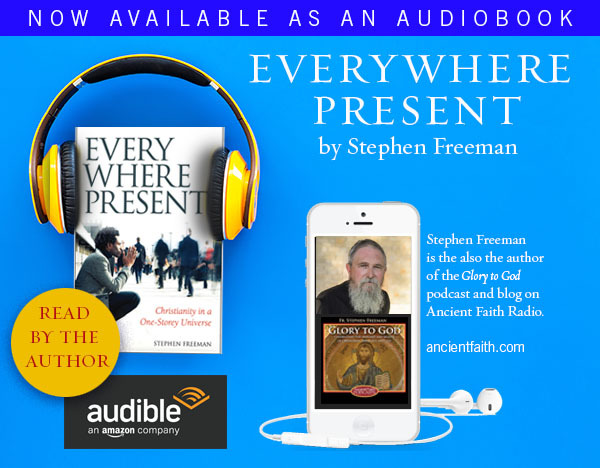 Stephen’s series on this issue could properly be seen as an expansion and reflection on the lesson of Christ’s parable of the Publican and the Pharisee. I’d really like to fully grasp what you’re saying here, so I was wondering if you might be so kind as to expound a bit on “the ascetic struggle being a language…..”? Sorry you’re having difficulties with this series. Your comment, viz. calvinism and total depravity suggests to me a place that could be clarified. There is a distinction in these articles between “moral” and “ontological.” Moral here has to do with being right or wrong (in behavior), and adhering, more or less to a standard, commandment, teaching, etc. Ontological has to do with the matter of our being. And it is primarily ontology the concerns the major fathers in their writing and is often seen in the spiritual elders as well. So first, following St. Athanasius, we are created out of nothing – our nature is this “nothingness,” in that there is nothing about us, in and of ourselves, that even maintains us in existence. This doesn’t mean we are bad, much less depraved. It just means that apart from God sustaining us in existence, we would fall back towards that nature – towards nothingness. Theosis, our ultimate salvation, is being conformed to Christ’s image, not merely in a moral manner, for this is not really our main problem. If we don’t exist, then morality is a moot point. But through grace, we become partakers in God’s own life, and thus have eternal life. The Fathers, St. Maximus in particular, describes this as a movement from being, to well-being, to eternal being. These thoughts on being and life were largely lost through the importation of a legal/forensic model of understanding, in which what matters is our legal/moral standing before God, and “eternal life” is reduced to reward or punishment. It is certainly the case that growth and movement towards eternal life would have moral consequences – but those things are quite on the surface and can often be both misleading and beside the point. It can easily sink to a moralism in which we mistake holiness for adherence to a standard instead of a true change in the very mode of our existence. As to practical direction – the Elder Sophrony whom I have quoted frequently – says, “The way up is the way down.” This is simply the same thing that Christ teaches about loses our lives. The way up – is self-emptying love, self-emptying prayer self-emptying generosity, self-emptying forgiveness of everyone for everything. “That the human nature is created and so, is unavoidably mortal; with death man’s entire psychosomatic being comes to an end. All of his psychological and mental functions cease to function: his self-conscience, reasoning, judgment, memory, imagination, and desire. Man is no longer able to function through the parts of the body in order to speak, to call to memory, to distinguish, to desire, to reason, to be impassioned, and to see” (Odigos, Migne P.G. 89, 36). I think the first time I read that passage I was frightened of the abyss. It was an abyss of nothingness. But that is simply the recognition of death. That recognition of death is true humility. It is then that we cry out from the depths of our being in prayer to God and can be sustained and filled with His life. I am about as far from being a Calvinist as anyone I know. But if you find the emptiness and nothingness of our being to be a problem, your argument is not with me, but with the whole Patristic tradition, and the Scriptures themselves. Morality is a “red herring.” It is not the primary concern of the Fathers or repentance. There is something so much deeper that we are called to – as I’ve described above. As for your thoughts on the treatment of alcoholism, we certainly disagree. It is the language of the spiritual person, the language with which he certainly does NOT prove his worth, or his value, or his strength… but the language with which he expresses his desire towards God, the recognition of his utter weakness and neediness. It expresses his unshakeable faith that “you are here God, and I stand in your presence, under your Fatherly gaze”. It is my first and foremost my ‘standing in His presence’ and expressing my desire for the Holy Spirit to come and cultivate His seed, actualise the potential of the first birth (St Maximus) into the second. It is the language that speaks “not my will but yours”. Whether we are begging like beggars showing their rags or thanking like the destitute harlot who suddenly finds herself clean and radiant, unexpectedly having been chosen to become the King’s wife (St Macarius), we use the same language of ascetic struggle, fasting when hungry, standing when drowsy, studying when tired, praying when lazy, resisting when agitated, focusing when distracted, staying awake at night, keeping silent when provoked etc. One who is head over heals in love gladly misses meals, walks for miles and effortlessly stays up all night just to get closer to his beloved. “Humility is rare in youth”-I’m guessing this is because, in most cases, physical death is so foreign to the minds and bodies of the youth. Death is basically non-existent to them (at least that has been my own personal experience). The reality of death is a slow realization throughout the years of one’s life, until you wake up old and noticeably fragile one day, at which point death is undeniable. I think maybe the connection between humility, or more precisely, death of the ego, to physical death of the body may be more “real” in a hidden, invisible way, than what we typically realize -as if death of the ego and physical death were actually one and the same thing. I think most people would not actually relate the two kinds of death, because most people think of ego as a purely mental construct, while our actual, or our “real” death is purely bodily; mind and body a two different distinct entities. Mind is spiritual, while body is not. The healing of the ego is to avoid spiritual death, while ultimately in the end there is nothing we can do to heal the body to avoid physical death. And if our spiritual egos have been healed, then when we physically die it will be of no consequence to us, only to our bodies, which aren’t worth much anyway since they are just vehicles for our spiritual minds. The fact that God will eventually give us a new “vehicle” to drive in the resurrection is just a nice afterthought. But this common way of thinking about ego-death and bodily death as separate, unrelated events is false. Ego-death and physical death are both expressions of the same ontological fact of our being. We are dead things. Ego-death and physical death are both revelations of this singular reality of our being. In our youth we are in denial of both, in our old age we at least become disillusioned concerning our physical death, and maybe if physical death and ego-death really are two sides of one and the same coin, then at some point we will indeed be disillusioned about the deadness of our egos -this will be hell in the afterlife for some, and eternal peace and rest for others. This is ultimately why “saving” our egos/spiritual minds (commonly referred to as morality, which is often mistakenly equated with sanctification) has nothing to do with following Christ as a member of His Body, the Church. Rather, we must let our egos and bodies be what they are -dead, in order to seek out another, different source of life to enliven and energize us-God Himself. This is why asceticism is not sanctification (which, I think, is what many Protestants falsely believe we Orthodox are trying to achieve in our ascetical practices, and then, therefore, referring to us Semi-Pelagians trying to save our own souls through works), but, rather, an effort to disillusion ourselves by peeling away at the dark curtains covering our eyes that is our ego, in order to open up the possibility of repenting -asceticism is an effort to experience the reality of our deadness, so that we may be filled with Life from the only real source of energizing life. And, yes, this description of our Christian life can be mistaken as some sort of description of Calvin’s total depravity, and maybe even irresistible grace, as Adam above has mistaken it. But this is because of our modern, cultural understanding of free-will. If our ego is dead, then so is our will, and thus we are Calvinist. But Orthodoxy retains both truths at the same time -that we are dead things, and that we possess a free-will to choose our directional movements either towards or away from union with God. We are dead, but we are also persons, and all entities that are persons have a will that they posses as their own, and to possess a will is to have free movement of choice. For Orthodoxy, as opposed to Calvinism, possessing a free-will to choose to either direct our gaze upon objects of corruption or Incorruption does not conflict with the fact that our own ontological deadness/corruption often becomes apparent to us through “reflections” of deadness (such as addictions, gluttony, lustfulness, greed, etc.) -like a corpse who gazes into a mirror and sees rotting flesh on his face. After we gaze into the mirror and see our own rotting flesh we can then begin to realize the futility of trying to re-vivify this rotten flesh by our own powers, and instead freely direct our gaze towards God who has the Power to give Life to the dead. Am I trying too hard to square a circle here? Or is it possible that a forensic/legal framework does not necessarily preclude an Orthodox understanding of the faithful Christian life–mutatis mutandi all applicable terms like salvation/sanctification, etc.? I hope being in your 30’s still counts as young, lol. But do not applaud me, my head understands thing that my youthful heart does not yet. I’ve had some experience with illness when I was in my early 20’s, and back then I despaired -didn’t God understand that to cut my life short was to take away all meaning and purpose in my life? Needless to say I did not die back then, and I began trying to rebuild a loving relationship with God (I didn’t love Him very much back then when I thought He was going to let me die). But now in these past few years I am faced with illness again. I have a chronic blood disorder. It has the potential to eventually progress into certain incurable cancers. But my doctor has told me I will live a long time, long enough to raise my young children even. He said that sometimes people with this disease get lucky and even live full lives, but since I’ve been diagnosed unusually young (most people are in their 50’s or 60’s) we will just have to wait and see. But I’ve done my research, and I have serious doubts that I will get to enjoy my grandchildren. I don’t know, I cant say, I’m not a doctor. And doctors do not know, they cannot say, they are not God. But anyway, I have lost the luxury of a happy, youthful denial of death’s inevitability, nor do I want that luxury anymore. Actually, to be honest, I often slide back into this happy denial, until I remember. But I think I want to remember death. I don’t want the difference between living 15 more years or 55 more years to be of any consequence for me anymore. This is a very hard sentiment to maintain, though. I have young children. But I do feel that I may be finely learning what it means to truly be alive. And I have to thank you for much of this learning. I am truly indebted to your work on this blog. I do not believe it was mere accident that I found my way to Orthodoxy, and to this wonderful blog at this point in my life. I do indeed see differences between the forensic/legal model and the Orthodox vision described here. Chief among them is the freedom that Orthodoxy offers me to confront and accept my true self in all of its brokenness. The forensic model generally emphasizes that God in His holiness cannot even look on sin. The (presumably unintended) consequence for the Christian is that he also is discouraged from looking at his sin–be holy as God is holy, after all. Once you’ve confessed it (superficially, please) it is best to run from any thought of it and to cling to God’s mercy. But what I have been hearing (and it rings both true and compelling) is that Christ, having defeated sin and death by Himself entering into them, is found most truly when I do accept my sin and “bear a little shame.” In knowing my true self, being still, descending to the heart–however it is said–I will find God most assuredly. When I look at my sin, I will see Christ. This is a great comfort. Im not being completely honest, I don’t think, where I said, ” But I think I want to remember death. I don’t want the difference between living 15 more years or 55 more years to be of any consequence for me anymore. This is a very hard sentiment to maintain, though.” I think it is more honest to say that while I want to live to be old, I am realizing that I want to want to remember death, so that 15 yrs or 55 yrs will become of no consequence to me. But right now Im not sure that I posses this sentiment. I also like how you put things in your post. I would only say that thinking back, I was aware of the abyss of death and nothingness (I took my modernist “religion” seriously) and that my youthful distractions and ambitions were (and still are) a way to avoid the pain of that realization. That ‘sentiment’ you depict – constant mindfulness of death – is a most desirable gift of grace. It is clearly not morose, but jubilant; the primary thing a Christian needs to do is embrace and love death, or else he must surely suspect that he does not love God as he supposed he did; besides, how could he love Him and while at the same time wanting to tarry on Earth…? Death is the ‘ticket’ to Him for a believer. And this is what makes every second meaningful for him. St Isaac the Syrian speaks of this unceasing ‘sentiment’ exceedingly admiringly, scandalously even. I remember him saying that the devil is prepared to endow a person with anything and everything of this world, only in order to prevent that person from ever even discovering the power of this ‘sentiment’ (in case they try to acquire it), because it truly has the power to annihilate the devil’s sway completely. Thank you for this powerful post and your recent comments about ontology vs morality. How we see ourselves and how we attempt to relate ourselves to God is truly life giving or destroying. So much of my problems with morality has been my pointless attempt to fuel this morality without God. The Pharisee was indeed taking some of the right actions of fasting and alms giving yet doing this with his false sense of his own power that left his actions prideful barriers from God not humble gateways to God. My mistaken self sufficiency or self despondency will always be devoid of any Life giving grace since it is centered in me and separated from Him. A key is for me to see the utter bankruptcy of my attempts to do His work without Him…and all that he outlines in His commandments is what He wants from me (His Will) and He is anxious to help me perform these actions (His Life) in me if I’m willing to abandon myself and rely upon Him. My life is like a pointless, never ending virtual reality game full of imaginary visions of what I’m accomplishing and doing in a futile, lifeless attempt to find meaning without His Life, Love,Truth, and Goodness. I think of pride and despair as ‘wiper blades’ that go back and forth on the windshield of my life whenever my life is full of the mistaken belief of my own self sufficiency. My pride tells me ‘that I don’t need Him’ and my despair tells me that ‘He can’t help me’. AA uses the phrase ‘egomaniacs with inferiority complex’ as a way to describe this state of separation from God characterized by pride and despair. When I hear these words echoing in my mind and thoughts, I know I’m in that truly sinful state of separation from God. I’ve lived for many years in this tortured place of attempting to create my life rather than relying on the Life Giver for a True Life in Christ. One of the great blessings of my addiction is the ‘innermost being’ realization that I am an addict and could not live without relying upon a Power greater than myself. There was no confusion that I was capable of keeping myself sober. The AA Big Book describes this as ‘lack of power that was our dilemma’. Paradoxically, the absolute foundation of the AA program is built upon the rock of our acceptance of our ‘powerlessness’. So, I have this profound experience of my absolute need for a relationship with God and the need for His Power to live while I’m still on this side of the grave (miraculously through His Grace). The AA Big Book describes this salvific relationship with the phrase “we have a daily reprieve based upon our spiritual condition’. You will hear phrases in AA meetings like “this is a matter of life and death”. AA is full of great experiential reminders of the unceasing, limitless bounds of God’s grace in the amazing transformation seen day in and day out in meeting rooms. I find Orthodox services full of incredible reminders of who God is and how we should relate and cooperate with Him to find His Power. Life, Goodness, Truth, the ability to cleanse our souls, salvation….these are attributes of God not of me. I cannot acquire these gifts without God ; I can only rely on His Power as the Treasury of Good Gifts, to give these gifts to me. All that is most important in life is a gift….I haven’t willed myself to live, I haven’t chosen the time or parents I have, each breath is a constant reminder of the unconditional gift of Life He gives. In his freedom, he allows me to delude myself into thinking this is of all of my doing and all about me or to follow Him and His path. The Orthodox Matins Service begins each day in total darkness with the Six Psalms. These Psalms are amazing in how they teach what to do with our powerlessness to grant ourselves Life. My lack of power for Life should create in me this insatiable ‘thirst’ for Him and willingness to abandon the falseness of what I am without Him for the Truth I receive as a ‘cleave’ unto Him like a man drowning in the sea of my selfish desires as He sets me afloat on the Ship of His Church. There is nothing redeemable or salvific about our actions unless they are fueled by His Power. And His Life will always be only a concept in my head not an experience in my heart unto I know the true freedom of letting go of me and embracing Him. how very well said! God bless you! I am personally convinced that Recovery (AA) is a miracle of grace in our time. I’ve often thought about its serendipity. For one, it managed to throw of the yoke of a forensic view of life. Moralistic approaches of alcoholism had dogged the lives of its victims for years with pretty much nothing but shame and guilt – but rarely any healing. That AA should managed to get away from that is interesting considering its roots in the Moral Rearmament Movement earlier in the century. Second was the deadly disease itself. It sort of pushes all theory out the window – theory being the ruin of so much in our world. So, if it didn’t work, the proof always came crashing down. Next was honesty, a bedrock of the program. The only ones for whom the program doesn’t work being those who are somehow constitutionally unable to be honest with themselves. I could write a very long time on that alone. Lastly, was the simple grace of some Christian souls who offered guidance that ultimately was rooted in Christian tradition (Rev. Sam Shoemaker being one of the ones I know the most about). Orthodoxy itself is quite experiential in a similar manner. What we have from the spiritual writings of the Fathers is a description of “what works.” I think that it’s why it’s almost always paradoxical. What works is a paradox. AA cannot take someone into the depths of the faith and union with God – but it will sure get them a lot further than the average Christian will go (unless he is seriously pursuing the Tradition and living an Orthodox life). The Recovery Movement, as a presence within modern culture has spawned plenty of bumper-sticker sayings that are actually quite wise. It has doubtless had a leavening effect in a culture that is terribly, terribly sick. It’s not enough – only the Church is enough. But is something for which everyone should be grateful. Now this is a truth I have come to understand…but understanding something is not the same thing as owning something as a dear treasure our heart. I think am also beginning to understand why fasting (as well as other ascetical practices of self denial) is so important too. Its relates to this remembrance of death. When we eat without watchfulness, then the pleasures of eating good food entices our hearts to proclaim, “I like this delicious tasting food so very much, and thus I like it here on this earthly earth of ours just fine. Why would I ever want to leave?” But to “remember death” is the joyful longing for departure to be with the true Love of our hearts -God. He is the pearl of great price, for whom we gladly “sell all that we possess” by means of death! To push the other way a bit, I am beginning to wonder about those who have no touchstone with AA. Can morality/Orthodoxy/ontology be reduced to the addiction/powerless paradigm (say of passions)? I see the point, but it does not seem to be the whole story either. Is morality ONLY to be thought of in terms of a self deceptive quest for power and distraction (rather personal or cultural/historical) like step 1? Woud it surprse you to know that I am an old guy, diseased (soul and body) and “my heart still proves itself to be young, swaying back and forth between desires for earthly life and true life solely lived in God. I have my fears, my wants…But at least now I [hope] I am pointed in the right direction.” I plan to make out of that brief statement a book mark, fridge magnet, greeting card, poem–something, anything, that won’t dissolve in the storms or get lost in the woods of my heart. Thank you for your contributions to this amazing resource, for which I am continually thanking God–and Fr. Stephen. I won’t ask if your wise perspective comes from suffering or straight from God, because I think I know the simple answer: both. Prayers, and “Many Years”–which really means many moments, one at a time. No, thank you, albert. Your very gracious and kind words mean a lot to me. And it must be the case that we see the Face of our Beloved in death, else it would be the greatest loss indeed. Where I am at the moment, I think, is not yet seeing the Face clearly, but being willing to take the plunge because He says it will be ok (not that I have a lot of choice when it comes down to it). Oddly, the morality question (do the right thing) just doesn’t seem to have sufficient power to change a human life. I think maybe the bridge might be that, yes, “recovery” might be a theoretical or miraculous possibility, but it misses the point. Sometimes we have to give up things we like. Sometimes we have to give up things we love. Sometimes those things are things that are bad for us— drugs or alcohol are obvious examples. But sometimes, too, we have to give things up that aren’t bad for us in order to sweep the room for a greater outpouring of grace. So it really shouldn’t matter if an alcoholic could theoretically have another drink. That he or she is aware, like Bruce, of their utter reliance on God is a spiritual gift that is worth the price of giving up alcohol. May God grant that we each see the thing we love more than Him, and the grace to put it down! If I recall correctly you have stated you are not attempting to “negate” morality. Are you, however, not assigning it to nothing more than dust – nothing and thus simply another futile aspect of a futile “fallen” existence? Something to not trip over on the way to Grace (or more accurately, not to hold on to when the hand of Grace is being offered)? “all things work together for good”. Ok, then does not morality also have a place? I get the message about limitations (of anything including morality) – particularly in a culture that has emphasized a “moralistic” life in several different, conflicting and wrong headed ways, but can not this be over emphasized? I am thinking of morality like my morning breakfast – not salvific in anyway in of itself but in several important ways very much a part of life. What would a world be like without breakfast – how would it function? Is breakfast perfection? No, but it’s a “necessary” part of life. It certainly is a necessary part of corporate life – and in the sense that wisdom is contained (despite much falsehood obviously) in our corporate life it is part of that. I suppose I am admitting I am not totally convinced of your radical either/or distinction – that between “moral man” and “miraculous life”, at least beyond a certain pedagogical emphasis. Perhaps I am not buying into the addiction/recovery polarity and absolutes (I don’t think “absolutism” is the wrong word here) which it seems to so heavily lean on. Is our Christian life/calling really so completely circumscribed by this paradigm (and if so, should not every service of the Church be followed immediately by a meeting 🙂 )? Can’t quite put my finger on it, but I get a definite “baby out with the bathwater” vibe. We are “Christianly” called to a radical break with this world – is ALL the content of “morality” simply a part of the worlds futility, even if you grant the various personal, cultural, and historical distortions and abuses (going back of course to the pharisees and beyond). Are the commandments then simply a temporary injunction, a sort of “we will do this until the eschaton to try to limit a little bit the damage our own passions would otherwise cause – and oh by the way, the commandments really are nothing more than “filthy rags” in the end”? Perhaps I am losing the plot when “what is moral” is commingled (confusingly so) with “a person who is striving to be moral” (positive I think, or at least necessary) and “a moralist” (negative, like a pharisee). We also have the question of what is truly moral (commandments) and what is of man (everything else, including human “justice”, societal norms which are obviously diverse and relative, etc.) running through all this along with the question of whether a term like “moral” can be salvaged from “western distortions”. You talk of straw men and the distinction you are trying to make, but I wonder if several more distinctions are not necessary. OR, perhaps I am simply “trapped” in a moral philosophy – perhaps the Fast will help me with that! The way I see it is that morality has its place, it can be an esteemed place in the affairs of this world. The integrity of a true Christian is, in fact, such that one would be able to characterize them as ‘moral’. Staying on that would obviously be missing the forest for the trees though, Morality’s expediency being no more than the young man’s “All these things have I kept from my youth up”, who was clearly aware of, “what lack I yet?”, but writhed when ontology was offered him: “Jesus said unto him, If thou wilt be perfect, go and sell that thou hast, and give to the poor, and thou shalt have treasure in heaven: and come and follow me.” So, although morality can have a place, such as the scaffolding does in construction, (a place amongst many other possible components of the ‘scaffolding’) and it sometimes helps build some houses. Yet it’s not the house. In Greek we have a beautiful differentiation between morality (“ethiki”) and “ethos” – the first evokes something that you have no way of knowing whether it is purely pharisaic or not, and the second conveys a holistic integrity that can only be a corollary of something far greater than the first. Let’s see if we can quickly unpack this amazing idea in ways that really relate it to our discussion about ontology and morality. If you’re in the water and you know how to swim, do you see the lifeguard as a nice adornment for little kids who can’t swim but completely unessential to the quality of your own swimming experience? If, on the other hand, you don’t know how to swim and you’ve wandered into the deep end, the lifeguard becomes your ‘savior’ who has rescued you from death. How many of us really consider morality as a set of skill developments we can accomplish to be good rather than seeing our attempts to be good as foolish as a drowning man refusing to accept the help of a lifeguard? This is even further confused by the mistaken belief I have taken from my upbringing that any relationship with God is dependent upon our ‘goodness’ skill development. We must master ‘goodness’ without God before we can hope to have any relationship with Him. The point here is that so much of our ‘religious activities’ originate from a position of skill development on how to ‘be good’. We even believe we can and should accomplish these ‘moral tasks’ without God from the very same self-will and training we use to learn how to swim. If I’m not good, I need to rely on more training or self-knowledge to learn how to ‘be good’. We can further believe that our relationship with God is in a perpetual state of non-existence because my ‘goodness’ skill development is poor and underdeveloped. In short, I need more theology…more swim lessons…more stuff to shore up the holes in my own self-sufficiency while never letting go of this mindset of finding all I need from me and not from Him. My entire life was dominated by this belief that I was supposed to be self sufficient and that, very bizarrely, my relationship with God would also have to rely on this self sufficiency to attain a ‘goodness’ that would made a relationship with Him possible. No wonder by age 15, I was moving away from this angry, resentful God who was always demanding more of me than I was capable of producing from my own self will and self sufficiency. Others, better than me in their ‘goodness’ skill development, may find themselves convinced that they have sufficient skills, like the Pharisee, to please God in ‘moral’ actions while not requiring any of His help or participation. My key point is that my mindset of skill development and self-sufficiency is itself a huge barrier I must overcome and ‘repent of’ in my journey to union and communion and with God. If we accept the very Orthodox understanding of sin as separation from God, my attitude of self sufficiency and moral skill development as actions I take independent from a reliance on God are the very walls that perpetuate the ‘old man’ and must be dismantled/emptied for the ‘new man’ to live. We pray, we fast, we give alms, we confess, we commune, not in order to be better people, but to become alive in Christ. As we learn to die to the futility our self sufficiency, we find a miraculous balance between our ability to abandon ourselves and the appearance of God’s grace to fill and fuel our lives. The immensity of this grace matches the depth of our repentance and rushes in if we can humbly see ourselves as broken and lost dead men, hopeless and helpless without Christ. We share as creatures in the mystery of Life in Christ as we learn to live in the purity of His commands, with the illumination of His eyes to see and His ears to hear, and the discovery of our true nature and authenticity as members of His Body. I’m working on a follow up article that will be of use. But shortly, of course moral behavior, doing the right thing, following the commandments, is an important aspect of our spiritual lives. Moralism, however, raises it to a defining place where it doesn’t belong. The forensic/legal model ultimately created habits of thought in which it becomes everything. It is not. It is, at best, a means to measure the symptoms of the disease of death. But it can never be the means of the cure. It does not have the power to make the dead live. That’s a different matter. If we fail to pay attention to what does matter – life from the dead – then we’ve consigned ourselves to lives of symptom management. I’m simply suggesting that we open our eyes and see the actual truth of our situation and think and act accordingly. For example, most people will go about their day with some awareness of the moral struggle. Perhaps they neglect prayer. Generally, they will treat this as just one more thing on a list of moral failings. It is not. It is “the one thing necessary.” Active communion with God is not about morality – it’s about our very existence and well-being. And that’s just one example. Without right understanding, we make many poor choices – out of ignorance. I really latched on to your statement that prayer is “the one thing necessary.” I believe that it is, but I find myself trying so hard to make it so in my daily life that I fall into the trap of thinking that I CAN make it that. That I can make prayer the necessary thing. I start repeating formulas (sadly for me, unless i am reflective and quiet even the Jesus prayer sometimes feels hollow, like I’m just repeating important words the way other phrases ,or tunes, repeat themselves in my head endlessly and unbidden). The simple phrases help redirect my focus, but is that really prayer, and am I not being somewhat like the moralist who tries hard to follow rules? Should I expect that it is possible to “pray always”? I understand and have experienced how the Divine Liturgy and other services with priest and choir and candles are the essential prayer, and I feel blessed to be able to participate – but it’s the rest of the time, moments of stress or distraction, moments of what seems like happiness, moments of quiet: these times override the prayer “instinct” (urge, need, attraction–im not sure how to put it) so that I get to the end of the day and realize how little time, and therefore–evidently–how less important prayer actually is for me. And even at those times of approaching prayer, I often choose to read, not traditional prayers–which also feel stiff and lifeless in a way–but books, mail from spiritual friends, blogs like yours, all of which have a kind of feel’ or sense, of prayer. So while thinking about and being inspired by all the various comments to this post, I realized that your simple statement about “the one thing necessary” crystalized for me some irritating floaters in the back of my mind. I do not expect that there is a simple anser ; don’t even know if I am asking a question or merely describing an element of prayer itself. Just wanted you to know that your words take hold. Recognizing that prayer is “the one thing necessary,” is much like saying, “I love God.” In the model confession from the Pilgrim Continues His Way that I included in a recent article, we admit, “I do not love God,” because we obviously don’t act like it. In the same way, we do not think prayer is the one thing necessary, because we just do not act like it. Having said that, we turn our attention to the root: coming to believe that it is the one thing necessary. Prayer is not a moral activity – it is a matter of our existence. We should pray like we breathe – and just as often. You took the words right out of my mouth…you aren’t alone with regards to prayer. It has been suggested to me that I “just obey” regarding prayers. For example, in the morning I should still read the prayers even if I don’t feel anything since emotions can’t always be trusted. So obedience is better, and maybe for the few minutes I did actually pay full attention it will be true prayer. I know this certainly shows a lack of love for Christ. But I don’t want to be caught in a trap of “feelings” are the only real prayer and the rest is just me saying words. So how does obedience to the commands fit into the morality picture? I know everything is about union with Christ and not just following a moral code, but sometimes if I obey the commands ( prayer, confession, doing good deeds etc) without a real desire..then the desire for Christ is greater after I have prayed etc. Obedience is good. If we bring joy to it, it’s better. I have been thinking about these series of posts and have a few thoughts. I am not orthodox so bare with me. A long time ago I did something cowardly. I recoiled when a mentally ill person approached me. I was startled and didn’t have time or the forethought to act in love. I know I am forgiven by Christ 100 percent but my forensic way of looking at things leaves me without any way of healing from that sin. I will be affected by it some way in my soul and may repeat my cowardice or act out in some way. AA seems to get this as alcoholics are required to carefully make amends to people they have hurt. Really protestanism doesnt have any kind of guidance or teaching on this. I believe that God has forgiven me but inside I dont feel it has been resolved. My only place to go is maybe to psychotherapy or try to really forgive myself. That is why I have been attracted both to the idea of penance and making amends in AA. I sense the need to heal. Now to go back to your point. I can morally improve myself to help the mentally ill or the homeless. That is a good start but inside I may still feel the gut reaction of fear. What is needed is not more morality but a new being who is filled with love and not fear. I am reminded of the Band of Brothers movie where the captain tells the cowardly private that the problem is that he still thinks he is alive. If the private just realized he was dead, then he would be cured of his fear. That’s where the awesome (I use the word in its original meaning) sacrament of confession comes in. Discovering the ‘new man’ while confessing the ‘old man’ to Christ – in the person of Christ’s representative on earth – cures everything. Grace comes and does the curing. I really do not know of anything comparable (ie: that is accessible to non-Orthodox) I am afraid! Yes. The dilemma you describe is also driven by the absence of sacramental confession (which can also include penance in the form of amends where appropriate). We need the sacramental life because running around in our own minds is just a path to insanity. I like that series – Band of Brothers. I cannot explain why I am drawn to such films. It’s certainly not the violence – but rather the amazement of how anyone does anything at all in its face. As a child of the 50’s, I was surrounded by veterans of WWII, including my father. All of my life, they were the men to whom I looked up. It was simply an epic struggle – truly mythic in its proportions.